This bag is part of the much sought after Jeff Koons "masters" collection. 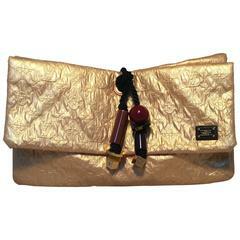 This particular clutch is the Fragonard version with pale pink piping. The lettering is in gold as the chain, the lining describes the life of Fragonard on one side and the life of Koons on the other. 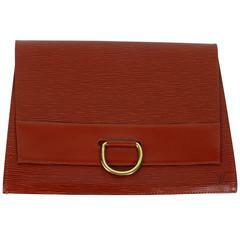 The strap is detachable , making the bag versatile, it is either a clutch or a shoulder bag. Strap drop is 8". Sold out all over the world, this item is brand new in its original box and comes with booklet, dust cover, ribbon and shopping bag. Louis Vuitton 2018 limited edition St Tropez cream damier trousse/pouchette. Brand new in box with original dust cover. 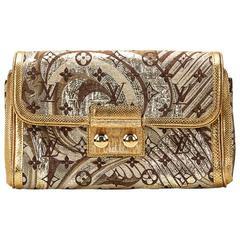 Louis Vuitton limited edition travel stickers pouchette. Sold out everywhere. Comes with dust cover and box. Hermès classic large Jige clutch. Brown leather and beige toile combination. Date stamp J for 2006. Excellent condition.